The F-5A and F-5B Freedom Fighter and F-5E and F-5F Tiger II are part of a family of widely used light supersonic fighter aircraft, designed and built by Northrop in the United States, beginning in 1960s. Hundreds remain in service in air forces around the world in the early 21st Century, and the type has also been the basis for a number of other aircraft. The F-5 started life as a privately-funded light fighter program by Northrop in the 1950s. The first generation F-5A Freedom Fighter entered service in the 1960s. Over 800 were produced through 1972 for U.S. allies during the Cold War. The USAF had no want for a light fighter, but it did specify a requirement for a supersonic trainer and procured about 1,200 of a derivative airframe for this purpose, the T-38 Talon. The improved second-generation F-5E Tiger II was also primarily used by American Cold War allies and, in limited quantities, served in US military aviation as a training and aggressor aircraft; Tiger II production amounted to 1,400 of all versions, with production ending in 1987. Many F-5s continuing in service into the 1990s and 2000s have undergone a wide variety of upgrade programs to keep pace with the changing combat environment. 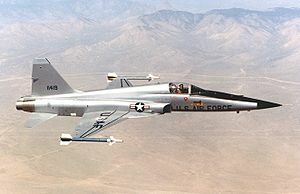 The F-5 was also developed into a dedicated reconnaissance version, the RF-5 Tigereye. The F-5N/F variants remain in service with the United States Navy as an adversary trainer. Northrop designed the F-5 (company designation N-156) to be a low-cost, low-maintenance fighter, but found there was little market for such a craft. It was designed around a pair of an afterburning version of the General Electric J85 engine which was originally designed to power the tiny McDonnell ADM-20 Quail decoy, then carried by the B-52 bomber. This requirement created a very small engine with a very high thrust to weight ratio. The U.S. Army expressed interest in it for ground support, but operating fixed-wing aircraft was a task largely taken over by the U.S. Air Force. The Air Force would neither agree to operate the N-156 nor to allow the Army to operate fixed-wing combat aircraft (a situation repeated with the C-7 Caribou). When the Military Assistance Program under the Kennedy Administration needed a low-cost fighter for distribution to less-developed nations, the N-156F was at the top of the pile, and subsequently became the F-5A. It was named under the 1962 United States Tri-Service aircraft designation system which included a re-set of the fighter number series (the General Dynamics F-111 was the highest sequentially numbered P/F- aircraft to enter service under the old number sequence). In 1970 Northrop won a competition for an improved International Fighter Aircraft (IFA) to replace the F-5A. The resultant aircraft, initially known as F-5A-21, subsequently became the F-5E. It was lengthened and enlarged, with increased wing area and more sophisticated avionics, initially with an Emerson Electric AN/APQ-153 radar (the F-5A and B had no radar). Various specific avionics fits could be accommodated at customer request. A two-seat combat-capable trainer, the F-5F, was offered. Unlike the gunless F-5B, it retained a single M39 cannon in the nose, albeit with a reduced ammunition capacity (the F-5E was equipped with two M39 cannon, one on either side of the nose). The F-5F was armed with Emerson AN/APQ-157 radar, which is a derivative of the AN/APQ-153 radar, with dual control and display systems to accommodate the two-men crew, and the radar has the same range of AN/APQ-153, around 10 nm. A reconnaissance version, the RF-5E Tigereye, with a sensor package in the nose displacing the radar and one cannon, was also offered. The latest radar upgrade included the Emerson AN/APG-69, which was the successor of AN/APQ-159, incorporating mapping capability, however, most nations chose not to upgrade due to financial reasons, and the radar only saw very limited service in USAF aggressor squadrons and Swiss air force. The F-5E eventually received the official name Tiger II. The F-5E experienced numerous upgrades in its service life, with the most significant one being adopting a new planar array radar, Emerson AN/APQ-159 with a range of 20 nm to replace the original AN/APQ-153. Similar radar upgrades were also proposed for F-5F, with the derivative of AN/APQ-159, the AN/APQ-167, to replace the AN/APQ-157, but was never carried out. Northrop built 792 F-5Es, 140 F-5Fs and 12 RF-5Es. More were built under license overseas: 56 F-5Es and -Fs plus 5 RF-5Es were manufactured in Malaysia, which plans to sell the aircraft after upgrading them; 90 F-5Es and -Fs in Switzerland, which currently leases some to Austria to bridge the gap between the retirement of the Saab Draken fleet and the delivery of new Eurofighter jets; 68 in South Korea, and 308 in Taiwan. The F-5 proved to be a successful combat aircraft for US allies, but had only limited combat service with the US Air Force in Vietnam. 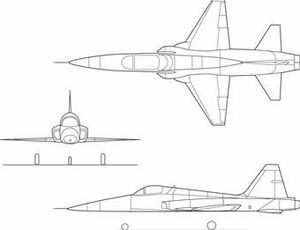 The two-seat F-5B actually preceded the F-5A and was actually a fighter development of the T-38 Talon supersonic trainer. The design would evolve into the Northrop YF-17, which lost out to the YF-16 in US air Force competition for a lightweight fighter but was eventually developed into the McDonnell Douglas (now Boeing) F/A-18 Hornet. Similar programs have been carried out in Chile and Brazil with the help of Elbit. The Chilean upgrade, called the F-5 Plus, incorporated a new Elta 2032 radar and other improvements. The Brazilian program, whose product is called the F-5M (Modernized), is armed with Python V coupled to the DASH helmet-mounted cue system, and new GRIFO radar, cockpit displays and navigation electronics. The Brazilian F-5M is also equipped with the Israeli Derby missile and can operate in a BVR environment. In the Cruzex 2006 multinational war games, a Brazilian F-5 made simulated kills on two French Air Force Dassault Mirage 2000N aircraft, which were supported by an E-3 Sentry and escorted by other two Mirage 2000C. This result was achieved by using the Derby and the information relayed by datalink from an AEW&C plane, the Embraer R-99, fitted with the Erieye AESA radar. Another upgrade programs have been carried out in Royal Thai Air Force by Israel being called the F-5T Tigris, armed with Python III and 4 (with the Dash helmet-mounted cueing system). Unlike other F-5s which have undergone updates, the RTAF aircraft cannot use BVR missiles. One NASA F-5E was given a modified fuselage shape for its employment in the Shaped Sonic Boom Demonstration program. The first contract for the production F-5A was issued in 1962, the first overseas order coming from the Royal Norwegian Air Force in February 1964. 636 F-5As were built before production ended in 1972. These were accompanied by 200 two-seat F-5B aircraft. These were operational trainers, lacking the nose-mounted cannon but otherwise combat-capable. In June 1967 the 10th FCS's surviving aircraft were turned over to the air force of South Vietnam, which previously had only A-37 Dragonfly and A-1 Skyraider attack aircraft. This new VNAF squadron was titled the 522nd. The president of Vietnam had originally asked for F-4 Phantoms used by the Americans, but the VNAF flew primarily ground support as the communist forces employed no opposing aircraft over South Vietnam, MiG or otherwise. Ironically, when Bien Hoa was later overrun by Communist forces, several of the aircraft were captured and used operationally by the NVAF, in particular against Khmer Rouge. In view of the performance, agility and size of the F-5, it might have appeared to be a good match against the similar MiG-21 in air combat; however, US doctrine was to use heavy, faster, and longer-range aircraft like the F-105 Thunderchief and F-4 Phantom II over North Vietnam. Several of the F-5s left over from the Vietnam war were sent to Poland and Russia, for advanced study of US aviation technology, while others were decommissioned and put on display at museums in Vietnam. Although the United States does not use the F-5 in a front line role, it was adopted for an opposing forces (OPFOR) "aggressor" for dissimilar training role because of its small size and performance similarities to the Soviet MiG-21. The F-5E saw service with the US Air Force from 1975 until 1990, serving in the 64th Aggressor Squadron and 65th Aggressor Squadron at Nellis Air Force Base in Nevada, and with the 527th Aggressor Squadron at Alconbury RAF Base in the UK and the 26th Aggressor Squadron at Clark Air Force Base in the Philippines. The Marines purchased ex-USAF models in 1989 to replace their F-21s, which served with VMFT-401 at Marine Corps Air Station Yuma. The U.S. Navy used the F-5E extensively at the Naval Fighter Weapons School (TOPGUN) when it was located at NAS Miramar, California. When TOPGUN relocated to become part of the Naval Strike and Air Warfare Center at NAS Fallon, Nevada, the command divested itself of the F-5. Relying on VC-13, redesignated VFC-13, to employ the F-5 as an adversary aircraft. Former adversary squadrons such as VF-43 at NAS Oceana, VF-45 at NAS Key West, VF-126 at NAS Miramar, and VFA-127 at NAS Lemoore have also operated the F-5 along with other aircraft types in support of Dissimilar Air Combat Training (DACT). The U.S. Navy F-5 fleet continues to be modernized with 36 low-hour F-5E/Fs purchased from Switzerland in 2006. These were updated as F-5N/Fs with modernized avionics and other improved systems. Currently, the only U.S. Navy units flying the F-5 are VFC-13 at NAS Fallon, Nevada and VFC-111 at NAS Key West, Florida. The Imperial Iranian Air Force received extensive US equipment in the 1960s and 1970s. Iran received its first 11 F-5A and two F-5Bs on February 1965 which were declared operational on June 1965. Ultimately, Iran received 104 F-5A and 23 F-5Bs by 1972. From January 1974 with the first squadron of 28 F-5Fs, Iran received a total of 166 F-5E/F and 15 additional RF-5Es with deliveries ending in 1976. While receiving the F-5E and F, Iran started selling its F-5A and Bs to other countries including Ethiopia, Turkey, Greece and South Vietnam; by 1976, they were all sold apart from some F-5Bs retained for training. After the revolution, the new Islamic Republic of Iran Air Force was partially successful keeping Western fighters in service during the war with Iraq in the 1980s and the simple F-5 had a good service readiness until late in the war. Initially Iran took spare parts from foreign sources, later it was able to have its new aircraft industry keep the aircraft flying. During the war with Iraq, IRIAF F-5s were heavily involved, flying air-to-air and air-to-ground sorties. Iranian F-5s took part in many air combats with Iraqi MiG-21, MiG-23, MiG-25, Su-20/22, Mirage F-1 and Super Etendards scoring many victories but alternately suffering many losses. However the exact combat record is not known with many different claims from Iraqi, Iranian and even Western and Russian sources. Also, it appears that many IRIAF pilots were victims of their own unstable regime - in many cases, they were imprisoned and executed by the Iranian government itself, often on vague charges. Adding to the haze surrounding the F-5's combat record is that many of the IRIAF's confirmed air-to-air kills were, for political reasons, attributed to the Revolutionary Guards. Nonetheless there are reports that an F-5E, piloted by Major Yadollah Javadpour, managed to shoot down a MiG-25. From a general standpoint, during the first years of service, Iranian F-5 fighter aircraft had the advantage in missile technology, using advanced versions of the IR seeking Sidewinder, later lost with deliveries of new missiles and fighters to Iraq. Today, Iran produces an indigenous aircraft titled the "Saegeh" which is built on the same platform as the F5. Ethiopia received 10 F-5A, 2 F-5B, from USA starting in 1966. In addition to these, Ethiopia had a training squadron equipped with at least 8 T33A. Later in 1970, Iran transferred at least 3 F-5As and Bs to Ethiopia. In 1975, another agreement was reached with USA to deliver a number of military aircrafts including 14 F-5E and 3 F-5F and so later in the same year 8 F-5E were transferred while the other were embargoed and delivered to a USAF aggressor Squadron due to changed political situation. The USA withdrew its personnel and cut diplomatic relations too. Ethipioan officers contracted a number of Israelis to maintain American equipment. The Ethiopian F-5 fighters saw combat action against Somali forces and air force during the Ogaden War (1977-1978). The main Somali fighter aircraft was the MiG-21MF delivered in the 1970s supported by MiG-17 delivered in the 1960s by the Soviet Union. Ethiopian F-5E were used to gain air superiority because they could use the AIM-9B air to air missile, while the F-5A were kept for air interdiction and air strike and F-86 for close air support. During this period Ethiopian F-5E were on training against Ethiopian F-5A and F-86 (simulating Somali MiG-21 and MiG-17). On 17 July 1977, 2 Ethiopian F-5 were on combat air patrol near Harer, when 4 Somali MiG-21MF were detected nearby. In the engagement 2 MiG-21 were shot down while the other two had a mid-air collision while avoiding a AIM-9B missile. The nationality of the F-5 pilots (Israeli or Ethiopian) is disputed. The better trained Ethiopian Air Force F-5 pilots swiftly gained air superiority over the Somali Air Force, shooting down a number of aircraft, while other Somali aircraft were lost to air defense and to incidents. However at least three F-5 were shot down by air defense during attacks against supply bases in western Somalia. During the Gulf War, Saudi F-5s flew close air support and aerial interdiction missions against Iraqi units in Kuwait. 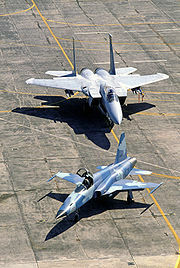 One RSAF F-5 was lost to ground fire on February 13, 1991. In Saudi Arabian service, approximately 20 Tigers have been lost to various causes over the years. The three prototypes were given the US Air Force designation YF-5A. Single-seat fighter version of the F-5A for the Republic of Korea Air Force. 12 F-5A Freedom Fighters, were tested by the US Air Force for four and a half months in Vietnam. Upgraded version of the F-5E in use by the Chilean Air Force. The temporary designation given to the F-20A Tigershark. Ex-Swiss Air Force F-5Es used by the US Navy as "aggressor" aircraft, intended to replace high-time USN/USMC F-5Es in the adversary role, and see service through to 2015. Upgraded version of the F-5E of Royal Thai Air Force by Israel. Upgraded version of the F-5E of Brazilian Air Force. Single-seat reconnaissance version of the F-5A fighter. Single-seat reconnaissance version of the F-5E fighter. The RF-5E Tigereye was exported to Saudi Arabia, Iran and Malaysia. Upgraded single-seat reconnaissance version of the F-5E. The Tigergazer is now in service with Taiwan. One F-5B was fitted with a 5,000 lb s.t (2,268 kg) General Electric J85-GE-21 engine, and used as a prototype for the F-5E Tiger II. Two-seat fighter version for the Republic of Korea Air Force. Two-seat trainer version of F-5E Tiger II. Single-seat fighter version of the CF-5A for the Royal Netherlands Air Force. 75 built. Two-seat training version of the CF-5D for the Royal Netherlands Air force. 30 built. Single-seat fighter version of the F-5A for the Spanish Air Force. Built under licence in Spain by CASA. Single-seat reconnaissance version of the RF-5A for the Spanish Air force. Built under license in Spain By CASA. F-5E built in South Korea for Republic of Korea Air Force. First introduction Time : September, 1982. F-5F built in South Korea for Republic of Korea Air Force. First introduction Time : September, 1982. F-5E built in Iran with unknown modifications and a mid wing. Northrop attempted to develop an advanced version of the F-5E, originally designated F-5G, as an export competitor for the F-16 Fighting Falcon. The F-5G was later redesignated the F-20 Tigershark. It received favorable reviews as a less expensive but capable alternative to early-block variants of the F-16 (and superior to the similarly never-purchased export variant F-16/79), but it never had the appeal of the much newer fighter design even at a lower cost. - Others: up to 3× 150/275 US gallon Sargent Fletcher drop tanks for ferry flight or extended range/loitering time. Prior to the scene of the very famous line "I love the smell of napalm in the morning" in the 1979 classic movie Apocalypse Now, 4 F-5 fighters were shown dropping napalm on a battlefield. These aircraft belonged to the Philippine Air Force which provided not only the F-5s, but also the UH-1H helicopters, for the film. The aircraft were portrayed as American in the film. Top Gun (1986) features a number of F-5Es and F-5Fs in latex wash-off paint as the fictional MiG-28s that battle against US Navy F-14 Tomcats.